From our Journey package all the way to Freedom's 100% royalties + 10% dropship fees* - we've got you covered. Automated royalty payment system. Select your ISBN* Choose imprint: THE LONDON PRESS or Gigalillion. The London Press book production system is unique and at the forefront of publishing web technology. Test drive it today. 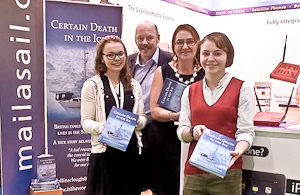 Authors Carl Lomas and Tracey Worth launch their book: Certain Death in the Ice, at the London Boat show. The book relates a remarkable story of a British family's expedition to sail around the world. The work was professionally typeset by The London Press and features over a hundred images documenting the various adventures and challenges faced on the adventure. Here is the books synopsis: Certain Death in the Ice is the true story of a British family's expedition to sail around the world. Join the family on their journey as they first sail to Rio, and enjoy a South American adventure all the way along the coast to the Pacific. Re-routing because of Somali pirate activity around the Suez Canal, the family journeys back around Cape Horn to the Southern Atlantic and the Falkland Islands - and then set sail for Cape Town, South Africa. Terror follows when struck by a wild gale and events take a dangerous turn! The family communicate their peril via satellite communications, and ship officers and friends around the world send survival advice - but no one is close enough at hand to mount a rescue. Together, the family face Certain Death in the Ice! As a complete novice in the publishing world, I was most anxious about all the pitfalls in the industry that I had read about before. Now I am the proud author of a book that has far exceeded my expectations. It is the result of a wonderful relationship that has developed between The London Press and me, the rookie author. They have been most supportive and understanding in dealing with all my fears and led me step by step through all the publishing stages. They have done this by providing a service of the highest quality, & have dealt with all my questions promptly and satisfactorily (and with great patience, I might add). I felt that my needs were always considered by them, that I could trust The London Press team to do whatever was in the interest of both parties. Without their insights the book would definitely not be what it is today. I really feel that now we are not only colleagues but have as a result become friends as well. Technically they definitely know their trade. My book was a particularly difficult project, and they handled all aspects superbly. The typesetters produced something that I never even would have envisaged as a possibility. The final printed product is stunning. In a nutshell: The London Press have made my publishing experience a pleasurable and fulfilling one. We are excited to report that The London Press publication Beyond Imagination by Goldlyn Ugonna has ***WON*** the ANA/NDDC Flora Nwapa Prize for Womens Writing. Big congratulations Goldlyn. Set in Nigeria, the novel narrates a woman's struggle to overcome poverty and social stigma in a society dominated by traditional cultural norms and values. Beyond Imagination explores issues such as marriage, family relationship, poverty, religion, culture, destiny, education and societal corruption. The London Press offers a choice of four publishing package options, with the option to receive 100% calculated royalties*. Books can be published under a choice of imprint names: The London Press or Gigalillion. Please click here for full details of each publishing package, along with various useful calculators that display figures for bookprice, dropship rates and royalty returned). Welcome to The London Press. We offer publishing under two imprints: The London Press imprint & the Gigalillion imprint ('Giga' as in gigabyte & 'lillion' as in million). This particular site is the home of our Masterpiece Book Creation System™, online book sales reporting, automated royalty payouts and the ability to have your book retailed (and made available) in the UK, the US, Australia, Canada, Poland, other significant parts of the EU area plus some areas of Brazil, India and Russia. We offer incredible royalty rates of up to 100%* on books sold via our POD book trade fulfillment channels, as well as a 0%* drop ship fee on books you order for yourself. Here at The London Press, we're really looking forward to hearing about your book. Great books are what it's all about. What we publish matters to us. Our specialty is transforming your work into a top quality publication in every aspect according to whatever it needs: cover design, editing, proofing, typesetting, etc... We consider that print on demand self publishing rules, but if you're looking for something more conventional, and you've a non-fiction work, then you might also be interested in our Traditional Style Channel offering as it provides a fantastic opportunity for your work to enter traditional book channels, as well as to receive some marketing and publicity support. The advantages of print on demand (POD) self publishing are numerous and benefits to authors extremely significant. This is our 14th year publishing books via print on demand systems and we have authors whose royalty cheques regularly total very significant amounts, authors whose books have played a significant part in their becoming well known TV and media personalities, authors who have fulfilled a personal dream and ambition of seeing their work in print, as well as authors whose books have been purchased by other publishing houses by virtue of them appearing first as a quality Gigalillion/London Press publication.